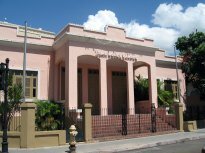 The Juan Morel Campos Music Institute is located right behind La Perla Theater in a 1924 building where the prestigious girls-only private school, known as Liceo Ponceño was originally established. The structure was acquired by the city back in 1947 and turned into Ponce’s Free School of Music. In 1977 it was renamed after the famed Ponce composer and conductor who became the most important figure in Puerto Rican music of the 19th century. A well-deserved expansion was inaugurated in 2008 by converting the adjacent fire station of many years into a contemporary annex with modern class rooms, new administrative offices and a much needed amphitheater. Just a few among the many prominent former students of the institute, are popular (Salsa) artists from Ponce Héctor Lavoe, José (Cheo) Feliciano and Papo Lucca. The virtuoso Morel Campos was born in Ponce on May 16, 1857 where he began to study music at the young age of eight under the direction of Professor Antonio Egipciaco. He then became a student of Manuel Gregorio Tavarez, undisputed father of our Danza, a rich musical style which is the maximum artistic expression of the Puerto Rican culture. With a catalog of more than 500 scores (including some 300+ Danzas), Morel Campos was undeniably the most prolific composer of the genre. Tavarez himself later called his disciple “the Bellini of the Puerto Rican music”. He also composed Waltzes, Symphonies, Marches and Overtures and was often referred to as “El Strauss de Borinquen”. Founder of the famed Ponce Firemen’s Band, Juan also had its own celebrated dancing orchestra “La Lira”. He died in May 12, 1896 at the young age of 38, days after suffering a stroke while conducting one of his own Zarzuelas, “El reloj de Lucerna,” at his beloved theater in Ponce. In 2001, he was posthumously inducted into the International Latin Music Hall of Fame. His Harvard graduate nephew, Dr. Pedro Albizu Campos, went on to become a famous revolutionary leader and Father of the Puerto Rican Nation. In 1923, an imposing bronze sculpture from the renowned Luigi Tommasi foundry in Pietrasanta, Italy was erected in his memory a few steps from the Ponce Cathedral. There, as a young kid, the musical genius handed out as an altar boy. At the foot of his statue his mortal remains were permanently laid to rest in December 1926.